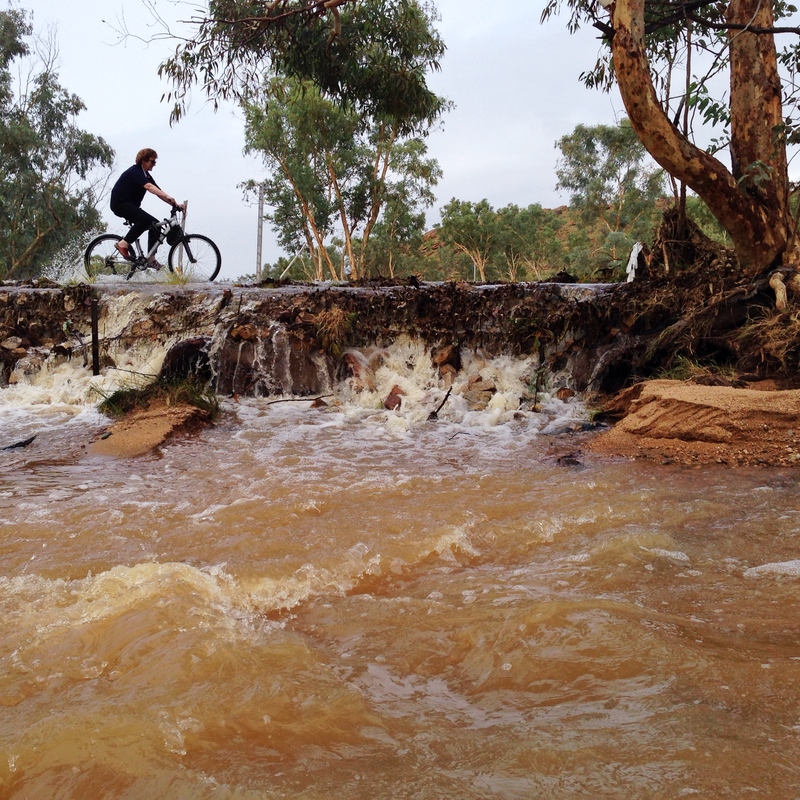 As you may know from my most recent post, Alice Springs was experiencing a rare ‘wet event’ in the form of rain. We have received two thirds of our average annual rainfall in a week, some areas more. 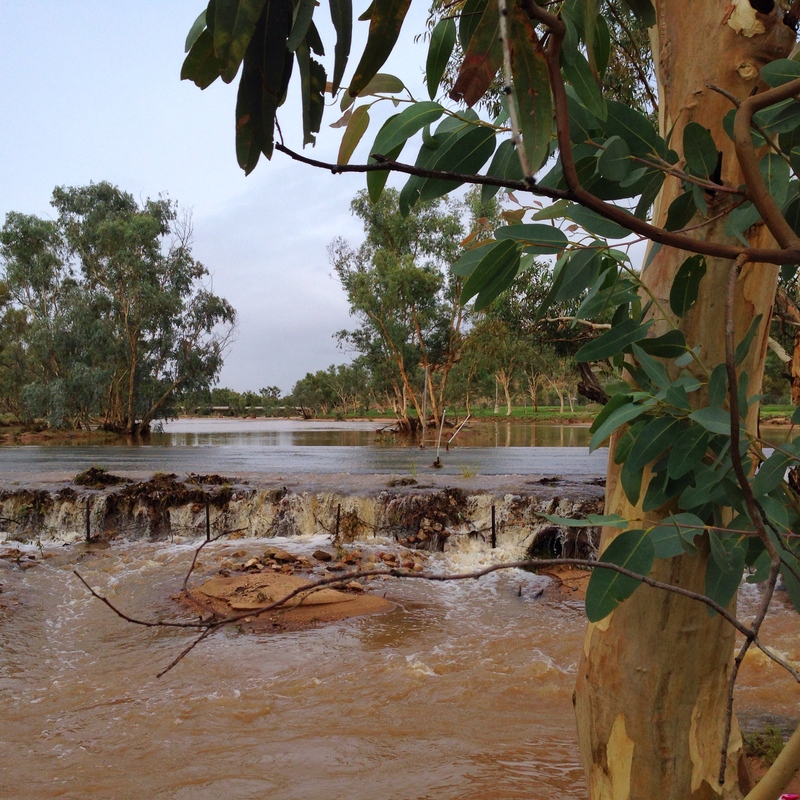 The normally dry Todd River has been flowing for days. 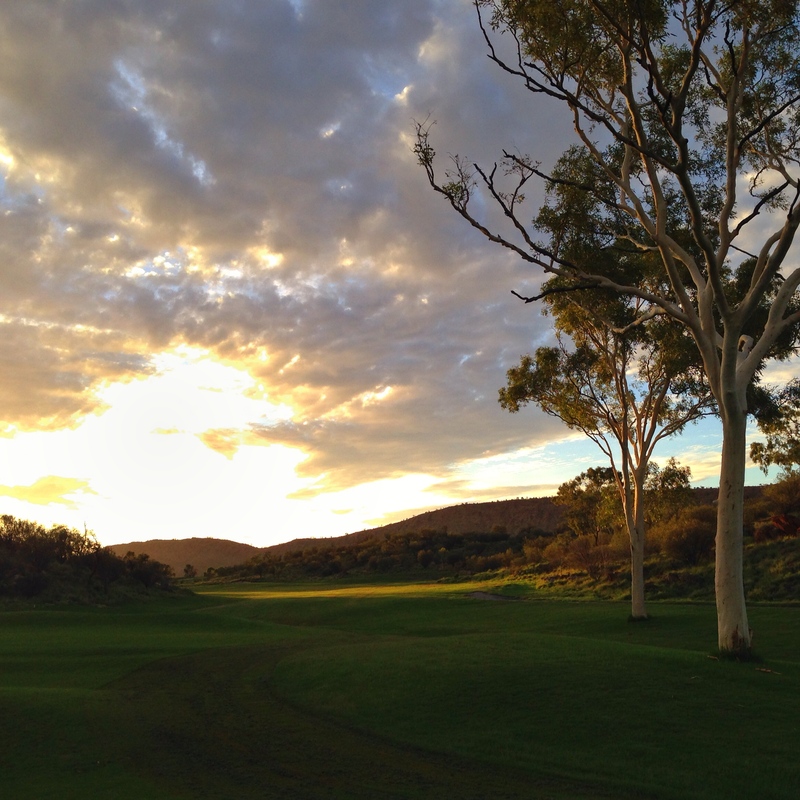 We received about 180mm of rain in 6 days. Some areas north of here have had more, areas near the airport have had less. Our average annual rainfall is about 280mm, or about 11 inches a year. Many years we get considerably less than that. It is not a vast amount of rain unless you are in the desert where plants and animals and houses and drains are not used to it, and it happens to come all at once!! As the weather has lifted, my iPhone and I have sent out to try and document some of the changes. 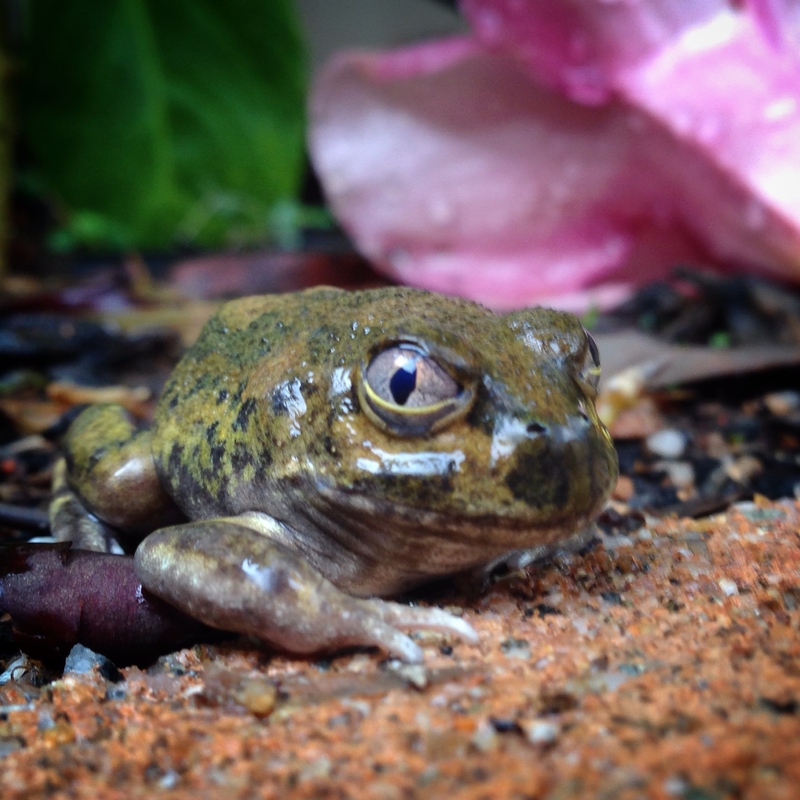 The Spencers Burrowing Frogs are everywhere… even as road kill… no photo… yech. But nearly every morning we are assisting one little frog out of the spa. This fellow paused to let me take a photo. Insects fill the air. Birds will struggle to fly if they consume all that is available. No doubt mice will appear in droves soon, with so much food abundant. One year we trapped over 50 mice, and then stopped counting. The air is so thick you could cut it with a knife, and no longer smells as sweetly of eucalyptus, but is tinged with the odours of decomposing leaves and drying mud. 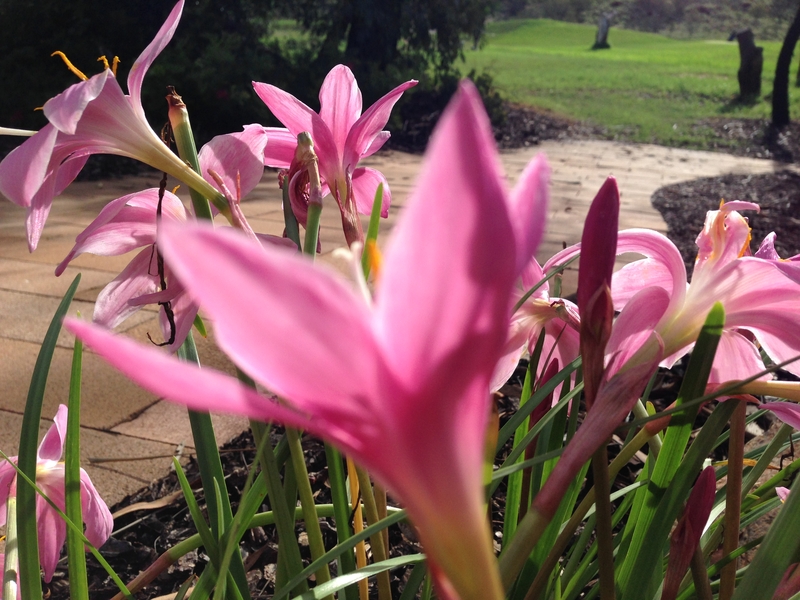 The ‘Naked Lady’ native lilies throw a new flower head or two every time it rains or we have a couple of cloudy days. 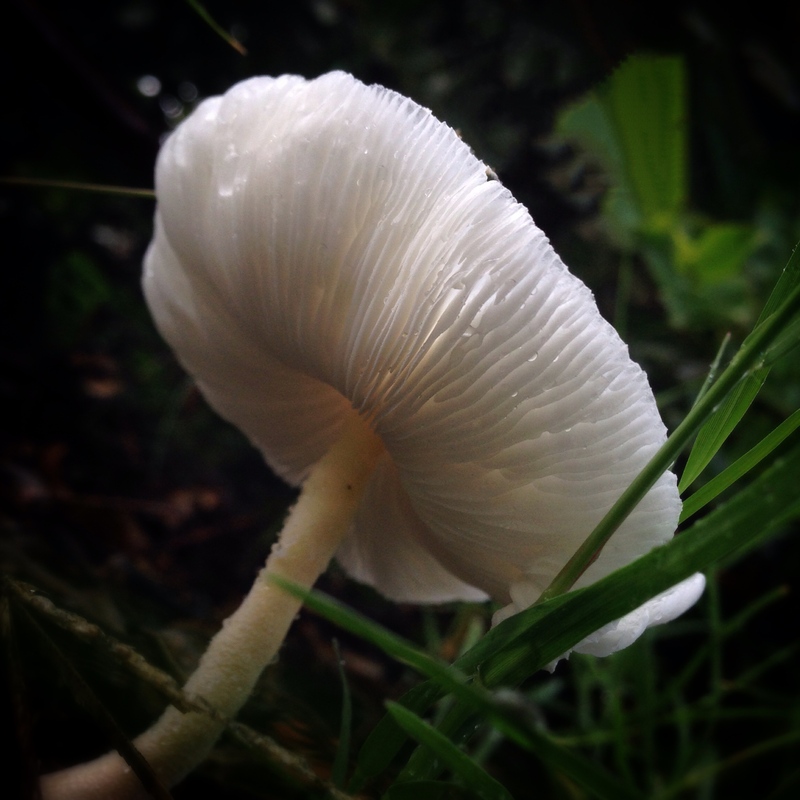 But after a big rain, they are positively prolific, and gorgeous! 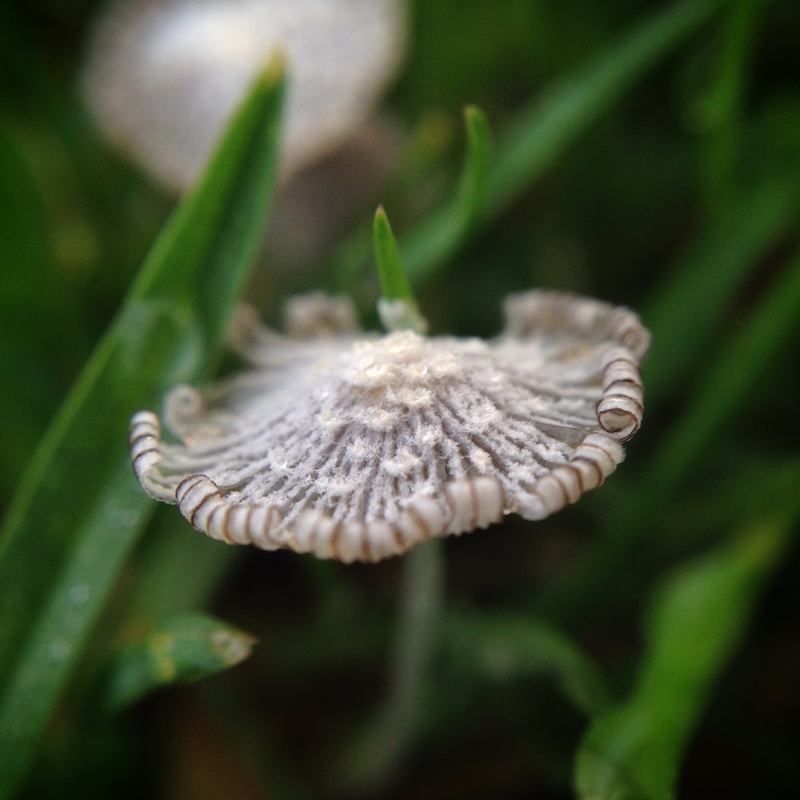 One morning, these tiny, fragile little mushrooms appeared in the herb garden. They had perished before day’s end. I know these may not be unusual for you to see, but they are a little out of the ordinary for us, and surely would not have sprouted but for the continuing damp conditions. 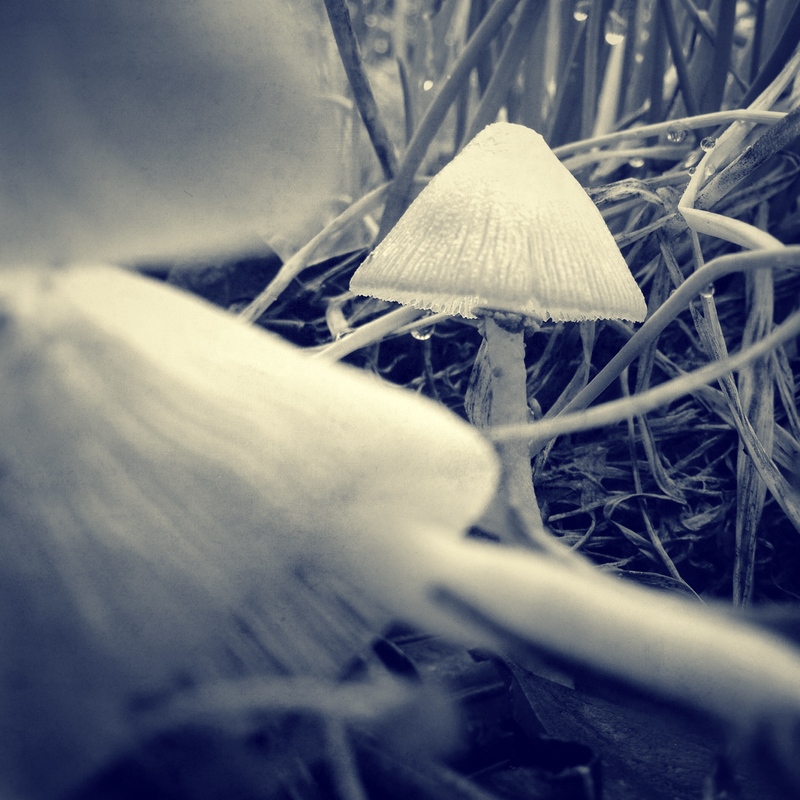 As I looked around the following day, I saw two more types of mushrooms. There were a few slack periods of rain when you could almost think the weather was lifting. I happened upon this nest of the ‘furriness’, and at first could not figure out what I was seeing. First glance told me it was a lot of mould growing on an apple. And then I realised it was moving! 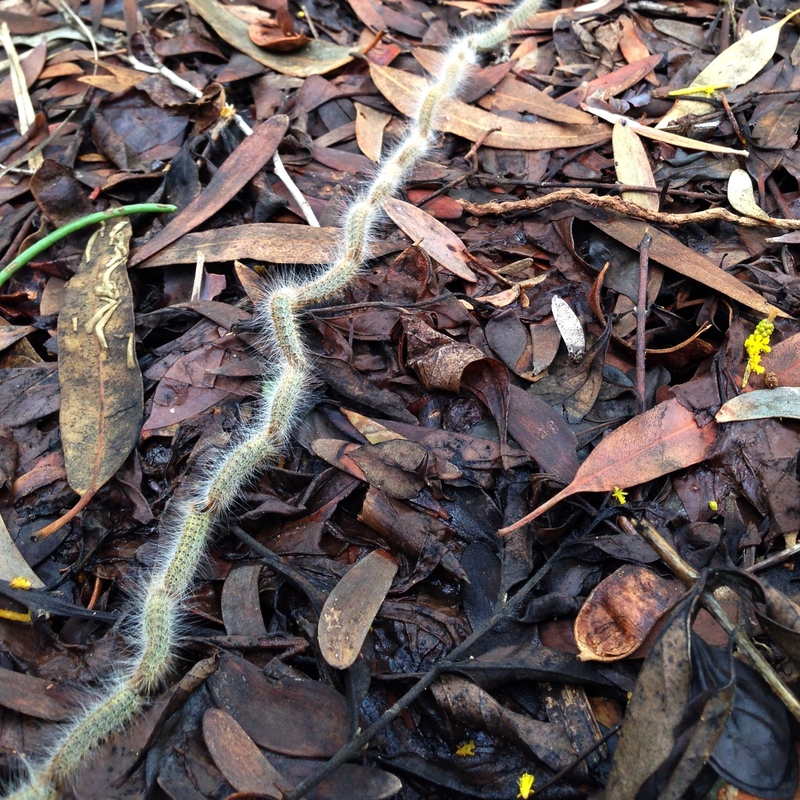 Dozens and dozens of caterpillars were writhing and squirming to figure out whom to follow, and to where. Such is the perfection of nature, they quickly figured out that only a few feet away was one of their favourite snacks, a wattle bush. Off they went. Top to tail. 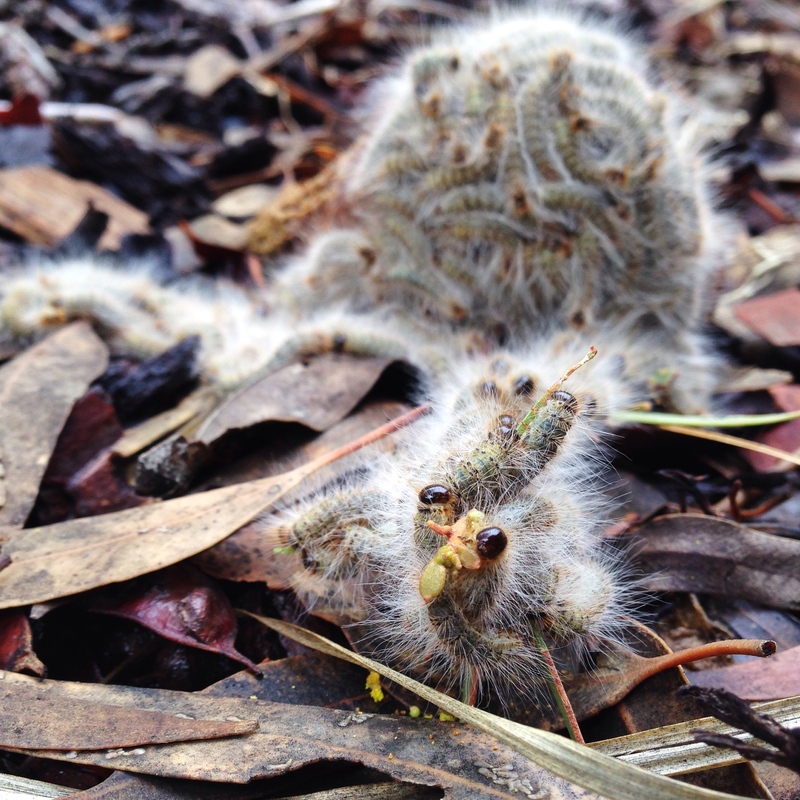 A little bit of lore, while we are at it… The ‘Processionary Caterpillar’ is also known to the Indigenous Arrernte People here, as the ‘Yeperenye’. Their Dreamtime stories tell of the Yeperenye caterpillar and two others, arriving separately and battling the ‘green stink bug’. 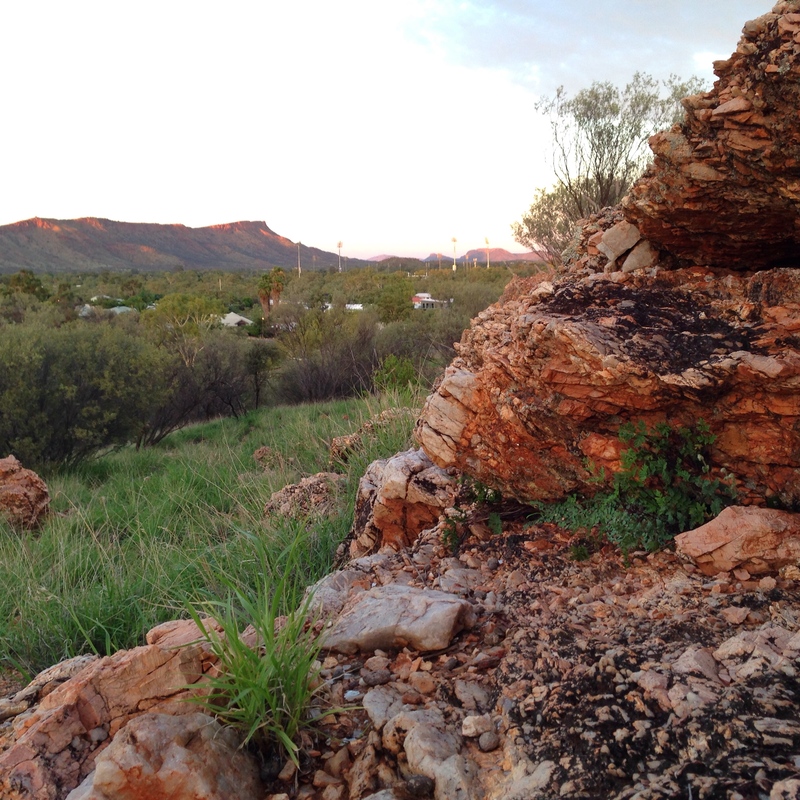 When the stink bug started to win the battle, the caterpillars ran, and the mountain ranges known as the MacDonnell Ranges represent their deceased remains. The land is turning green before our eyes, no longer the Red Centre for a few short weeks, more like the ‘Emerald Oasis’ or as my blog friend called it ‘Glen Alice’. The river is already going to sleep again. Everywhere there are signs where once were swirling waters. Everywhere things are growing. With ample water and now the sunshine, you may hear them from where you are! Stunning photos. How fortunate to get a shot of the processionary caterpillar ( what a mouthful- think I prefer the indigenous name) and such a good close up. And the frog too. Thanks also for including a dreamtime story from the Trad Owners. Love these stories so much. That last shot looks so green and lush. The last shot is fresh off the presses this morning, Francesca. The light is stunning to see after so many days of grey! Yes, Yeperenye is easier than the other name!! Thank you for reading. What a glorious study that diverts my attention from the sparkling Sydney day (at least via my window) to so many intriguing & beautiful things I would otherwise likely not encounter. I’m most engaged by the Spencer’s Burrowing Frog, I have a small carved stone frog of similar resemblance, and the pretty Naked Ladies… no-one who ever once was a little girl could not have at least a nostalgic affection for that pink! It was warm and humid here this morning. The radio said 24 degrees, outside it felt like the interior of a warm oven. According to a news article, the dew point is to blame rather than the humidity. I was pleased to get to the office. Fantastic photographs. The procession of caterpillars is amazing. Poor wattle bush with that lot on the way. You know, the funny thing about those caterpillars disappearing into that bush, I could not find a single one anywhere. I looked and looked and they seemed to just vanish, all hundred or so of them!! Thanks for reading, David. You’ll have to be quick, Betty, they seem to move along after they are rescued from the spa! The coyotes have moved into the area where Don and I grew up in the USA, and they are real nuisances. There were NO coyotes when we lived there. Thank you for conveying your enjoyment of my photos and stories. It is always energising when the rain comes to this part of the world. I love your photos! Especially that frog giving you what seems to be “the look”!! 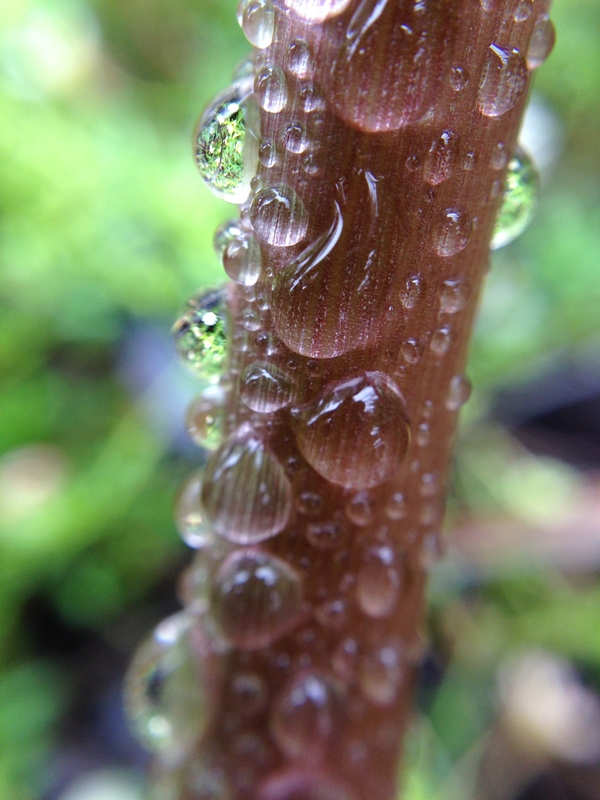 The stem covered in drops was interesting too… all sorts of interesting perspectives of the rain. Be safe and enjoy the rainy season! Having a closer look at what the wet weather does to my environment has been very interesting for me, quite inspiring as I see the area with a new perspective. Thanks so much for reading! Stunning photo Ardys, especially good to see the green tinge where I’ve only ever seen red. 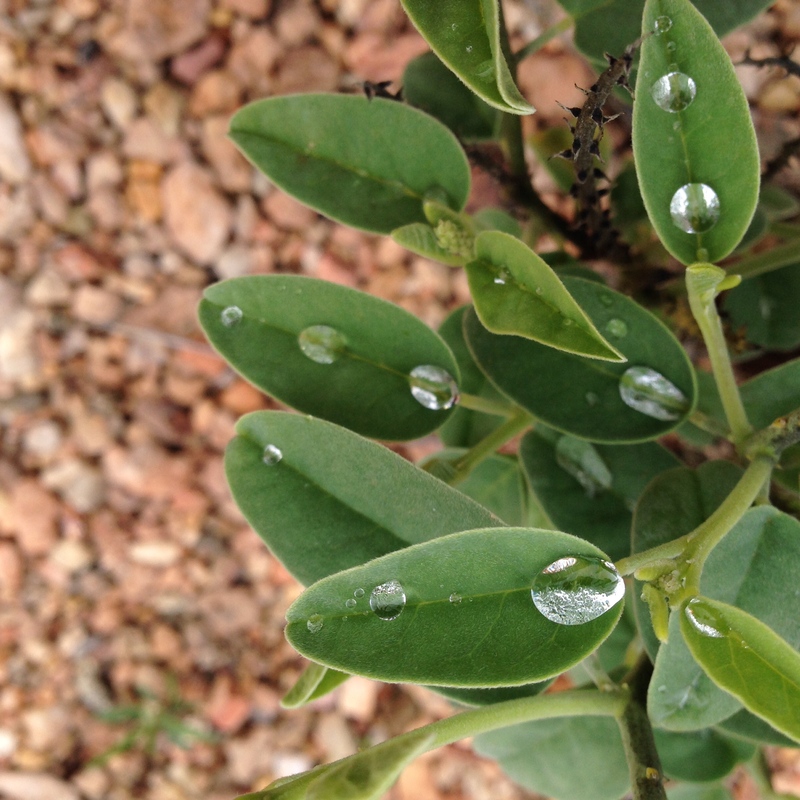 Your macro shots are exceptional! Thank you Sandra. Yes, the green tinge grows stronger by the day at the moment! The macro lens opens a whole other world to photograph, glad you enjoy the results! It’s like tuning into an episode of Australian National Geographic. Absolutely brilliant. Your camera work is awe-inspiring, Ardys–and despite your pushing away praise–you really deserve it for the level of talent you proffer up weekly. I adore the fuzzy ball of caterpillars, and I feel so lucky to have seen those photos and the video too. I’d never believe they would behave as they do if I’d not seen it all right here. A spectacular post today, Ardys. Absolutely amazing.